An Egyptian court has sentenced 11 Culture Ministry officials to three-year jail terms for negligence in the theft of Van Gogh’s Poppy Flowers from Cairo’s Mahmoud Khalil Museum in August. Deputy Minister Mohsan Shalan and the Khalil Museum’s former director were among the eleven. 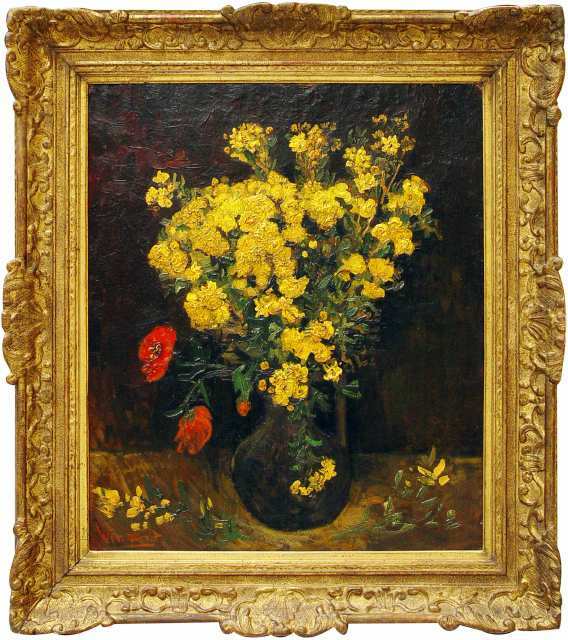 The Van Gogh painting, valued at $50 million, was stolen from the museum in broad daylight. Only 7 of the 43 security cameras were working, none of the alarms were, and the museum had recently drastically reduced its staff. There was only 1 security guard on shift, and when he went to pray the thieves slipped in, cut the painting out its frame and slipped out, sight unseen. Mohsan Shalan and the other officials defended themselves by saying they had asked the ministry for $7 million to upgrade security systems at a number of Cairo museums, including the Mahmoud Khalil Museum, but they were granted a measly $88,000. So basically the “you see what I have to work with here” defense the Joker’s plastic surgeon tried on him. Much like Jack Napier, Culture Minister Farouk Hosni didn’t find the argument persuasive. He testified against the defendants and denied criminally underfunding the museums. According to him, he delegated full responsibility for oversight of the Mahmoud Khalil Museum to Shalan who was given plenty of money by presidential decree. Documents Hosni introduced at trial included the decree approving over $10 million to renovate the museum. It’s nice to have a buck handy that just happens to stop right below you, I suppose. We’ll see where this ends up. The former officials won’t be imprisoned right away. A bond of 10,000 Egyptian pounds ($1,800) will keep them out of prison until the appeal is decided. This entry was posted on Wednesday, October 13th, 2010 at 10:01 PM	and is filed under Modern(ish), Museums, Roma, Caput Mundi. You can follow any responses to this entry through the RSS 2.0 feed. You can skip to the end and leave a response. Pinging is currently not allowed. Regardless of the facts of the case, it’s interesting to see high ranking officials being prosecuted for not doing their jobs. It would never fly here, of course.